To many people, the symbol of the cross is associated with religion, particularly Christianity. However, the cross symbol has been in use since long before Christianity began. In ancient times, the people of Babylon, Assyria, Crete, Egypt, Lapland, Peru and many other countries, used a cross with four equal arms to represent a Sun-God, to mean sexual powers or the union of male and female, and to indicate the four cardinal points of a compass – north, south, east, and west. Additionally, the ancients Phoenicians used the cross symbol for their Goddess of Love, Astarte. The cross symbol from these ancient civilizations has been found on tombs, coins, cave walls, buildings, monuments and sculptures. Even in the modern day, the cross does not always mean religion. In Asian cultures, it is used as a symbol for life or tau. During the spring/fall equinox, the sun crosses over the Earth’s equator causing both day and night to be the same length. Ancient cultures used the cross symbol with four equal arms to show this crossing over of the sun. 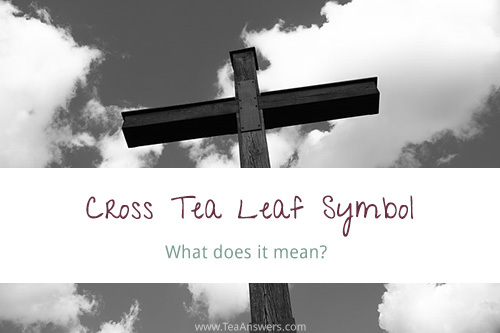 The cross symbol also has a vertical meaning and a horizontal meaning. The vertical line of the cross represents the number one, the world tree, the center of the world, and a connection between the heavens and the earth. The horizontal line of the cross represents historical and future time, and the horizon between the heavens and the earth. The cross symbol represents the numbers four and five. The number four is represented by the ends of the crossed arms and the number five is represented by the ends of the crossed arms and the central intersecting point. If a cross has shown up in your tea leaves, it has a double meaning – a good omen and a warning. In ancient times, the cross symbol was seen as a good omen, good tidings, or as a sign of protection. Today, the cross symbol in your tea leaves may be a warning about trouble or delays. There may be conflict with someone where you may have caused some of the trouble. The cross symbol showing up in your tea leaves tells you that things may not go as planned, but if you ask for help, you may have a better outcome and may have protection from the trouble. Learn more about how to read tea leaves.